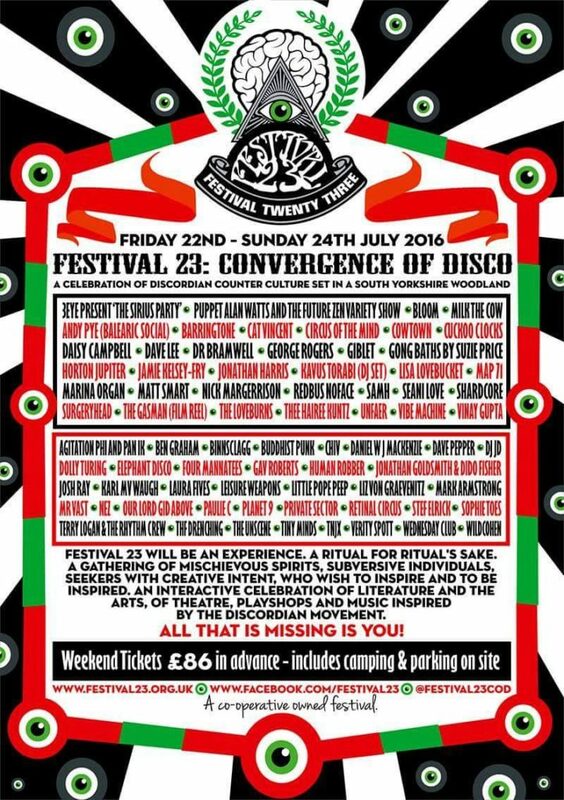 I was invited to run a workshop at Festival 23, a festival dedicated to all things Discordian. For those of you that don’t yet know Discordiansm is a religion disguised as a joke, or possibly a joke disguised as a religion. It emerged out of the West Coast counterculture of the 1960’s and involved people such as Robert Anton Wilson, Greg Hill and Kerry Thornley. Discordianism has a rich heritage of British involvement including bands such as the KFL and Ken Campbell’s legendary 9 hour play ‘The Illuminatus’ amongst others. Festival 23 was set to be an amazing mix of performance, theatre, live bands, workshops (playshops) DJ’s, art and all things in-between. The festival organisers wanted us to produce something that captured the essence of play and fun that the festival was all about. 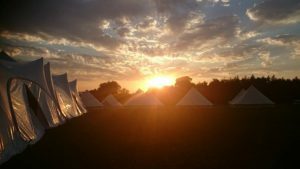 We decided to run an event on the Thursday evening for the people that had arrived early and the performers and festival crew. I felt it was important to create a space not only for the participants of the festival but the amazing crew and performers who were all volunteering their time to create this event. I worked with my friend and long-time collaborator Dido Fisher and our idea was to run a storing telling trance that had embedded messages about playfulness, exploring, meeting new friends and having fun. Dido and I then ran a trance induction and sent them group off on a journey down to meet their own inner Goddess Eris. As a therapist I love what I do, as I have mentioned in many of my blog posts, I think there is an incredible value in community and when like minded people gather together to create something special. This is exactly what I felt the organisers of this festival were trying to create and there motto for the weekend was ‘find the others’. As we are moving more and more away from a community based society and as we too often find ourselves in isolation events such as this are a worthwhile thing to support. It was a real pleasure to work on this amazing event, and the rest of the festival was fantastic!